Nano protection for upper and lower teeth for high impact sports. This dual-arch, low profile mouthguard is designed to enhance upper and lower jaw protection. Featuring a double monocoque shock frame, it absorbs and disperses impact away from the point of contact. Double Nano Fight Mouthguard is rated 5.0 out of 5 by 7. Rated 5 out of 5 by Elan S. from Double Nano Fight Mouthguard I recently purchased a mouthguard from Shock Doctor and I can safely say that it met my expectations. It was an easy process to have it fitted and the material is very comfortable and durable. Rated 5 out of 5 by H.D from great mouthshield this is a perfect fit mouthshield. it protects your jaw and teeth. I find the gel feature really great unlike other mouthshields with a hard inner side. 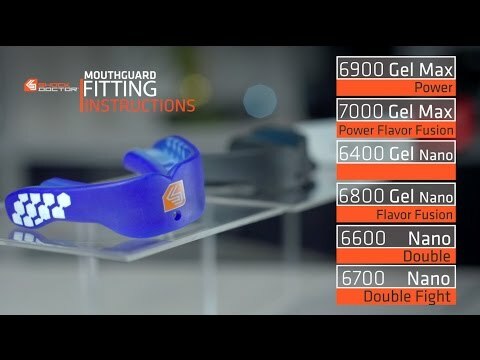 I really recommend this mouthshield. Rated 5 out of 5 by Kurt M. from Double Nano Fight Mouthguard This is a great mouthguard and works perfectly for me. It is easy to fit and encourages good jaw position. I highly recommend it. Rated 5 out of 5 by Max G. from Max Glazer Used it for a long time. Love how it locks the jaw in and lets me breathe. Onto my third one now.